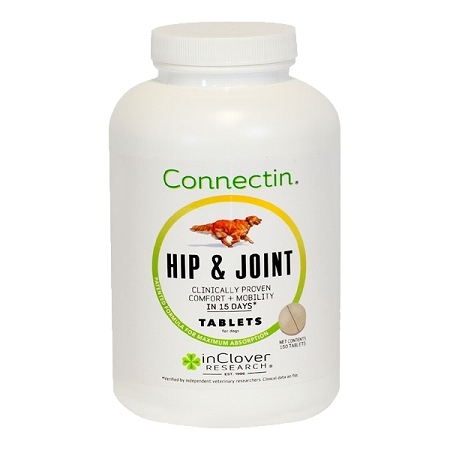 In Clover Connectin for Dogs contains glucosamine, chondroitin and nutrients that help reduce inflammation and joint pain in dogs. Each bottle contains 150 chewable tablets. 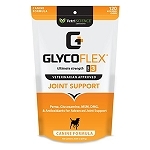 Also available in 50 count tablets, 100 count soft chews and 12 oz powder. 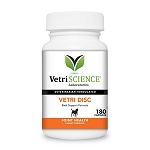 I adopt senior dogs and have been using Connectin for 4 years. Never did I imagine that my 15 year old bluetick coonhound would have the amazing amount of mobility he experienced while taking Connectin. 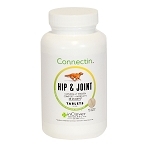 I will be using Connectin for all of my senior dogs for the rest of their lives! Alfalfa Extract (50%) - 100 mg.
Devil's Claw Extract (2.5%) - 55 mg.
Inactive Ingredients: Dicalcium phosphate, dried pork liver, magnesium stearate, microcrystalline cellulose, silicon dioxide. Each bottle contains 150 chewable tablets. Also available in 50 count size and 12 oz powder.